I'm willing to bet by now that you've read a whole lot of well-meaning blogs, each extolling the virtues of following various marketing best practices to achieve a ton of leads and reaching marketing nirvana. In and among the hordes of material covered, you've probably seen landing page optimisation come up before, and for a good reason. Quick refresher. Landing page optimisation is the practice of enhancing website elements to improve your conversion rate, with a particular focus on your site's landing pages. By improving the performance of your landing pages, you can secure more qualified leads, and up your overall conversion rate for the better. I'm going to let you in on a little secret though. Even if you tick all the boxes, landing page optimisation might not work for you (gasp!). "But why?! I followed all those best practice tips to a T!" There's a numbers game you have to engage in to see the results of your optimisations, and if you're not achieving those numbers, you're not going to generate sufficient data to prove your optimisations are making a difference. For example, let's say your average conversion rate on a particular landing page is 10%. That's below the general industry average of 20%, but it's not too bad. That said, you're keen to optimise the heck out of said page to take that number up by 10% and into the coveted realm of 20% and above conversion rates. Well, your landing page, with a conversion rate of 10% at present, needs to achieve a sample size of 13 000 visitors per variation to gather enough data to analyse. That's a combined total sample size of 26 000 visitors for both variations.Yikes. And so, sad as it is to say, if your landing pages aren't getting enough traffic, optimising them and testing your changes isn't likely to prove (or improve) much. But don't fall into the trap of thinking you shouldn't be putting effort into creating optimised landing pages – it's still vital to make sure you have solid landing pages. This means optimising your landing pages to work for you, making use of a sophisticated CMS, linking your landing pages to optimised thank you pages and frequently performing A/B testing to ensure you're always delivering on what your customer expects. A simple way to esnure you create landing pages that work for you is by downloading a landing page template from the HubSpot Marketplace. And what if your website is generating traffic like mad? Landing page optimisation and A/B testing are still very much a must for you. After all, you're fortunate enough to have the numbers to gather invaluable data and make changes that make a real difference, why would you not want to take advantage of that? Most businesses have more than one buyer persona. By creating landing pages targeted for specific users and driving traffic to them, you're more likely to see your conversion rate rise. You can use smart content on your pages to ensure what your users see is relevant to their unique pain points and needs. You can smooth the lead nurturing process by using smart form fields on your landing pages as well. This means that returning leads won't need to fill out the same forms over and over again, and you'll get more contact information with every form submission. When visitors arrive at your landing page, they should immediately know what the page's overall purpose is, and what it will do for them. By keeping headlines and subtitles clear and concise, you ensure your users will be able to easily distinguish the offer on your page. Also, don't be afraid to use strong, emotive words that appeal to your users. You want your headlines to compel your visitors to take action. Another important point is to align your headline with your calls-to-action (CTAs) copy. And, if you're going to be promoting your landing pages with paid ads or on social media, make sure your headline is aligned to the ad or post copy. Your landing page design has tremendous impact on your users' experience. It shouldn't be distracting or confusing and should direct visitors' attention to your form, and encourage them to complete it. Make sure to exclude navigation bars that might lead visitors away from your landing pages, and use white space on your pages wisely. Your use of colour is quite important too. 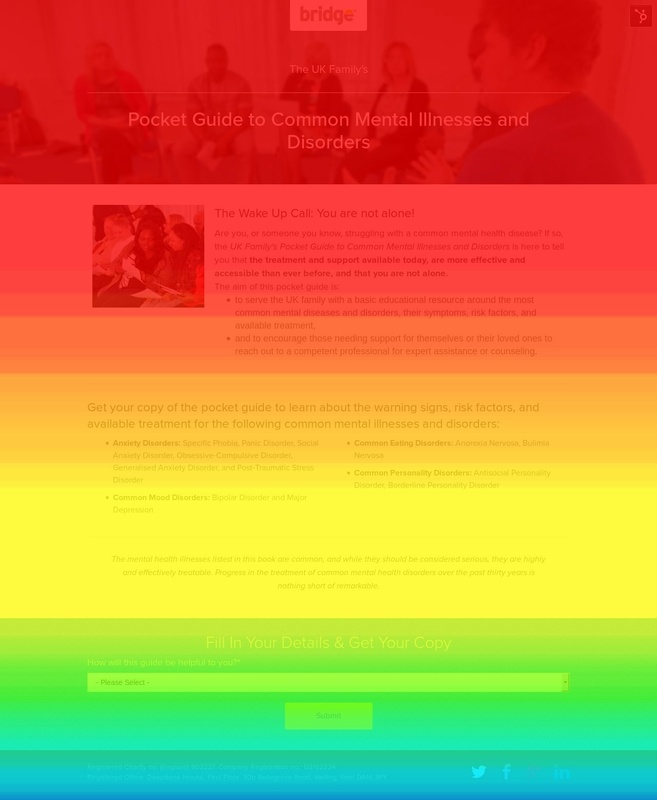 Besides your brand or website colours, the colours you use for CTAs and buttons can (and does) have an impact on the conversion rate of a landing page. The same applies to text on your CTAs or buttons. The only way to determine the most efficient colour and text combination is to rigorously A/B test your landing pages to gather data on what performs the best. Your form fields should also align closely with the perceived value of your offer. Asking for too much information in relation to the perception of value your visitors assign to your offer might scare them off from completing your form and converting. According to Wordstream, the average number of form fields is eleven, but reducing that number to four can result in up to 120% increase in conversion, so exercise caution when choosing which fields to include. Your goal with landing page copy is to get your readers to digest your most important points right away. If those points are hidden amongst paragraphs of unnecessary text, they're going to miss them. It's also a good idea to always try to keep your landing page copy above the fold, where your visitors can easily spot it when they're ready to convert. Make sure to use bullet points that briefly outline your offer's features so that visitors on a landing page can distinguish the outline of the offer and determine whether or not they want to download it. Remember to focus on your buyer personas, and highlight how your offer meets their pain points in these bullets. Did you know video is the most consumed media format online? 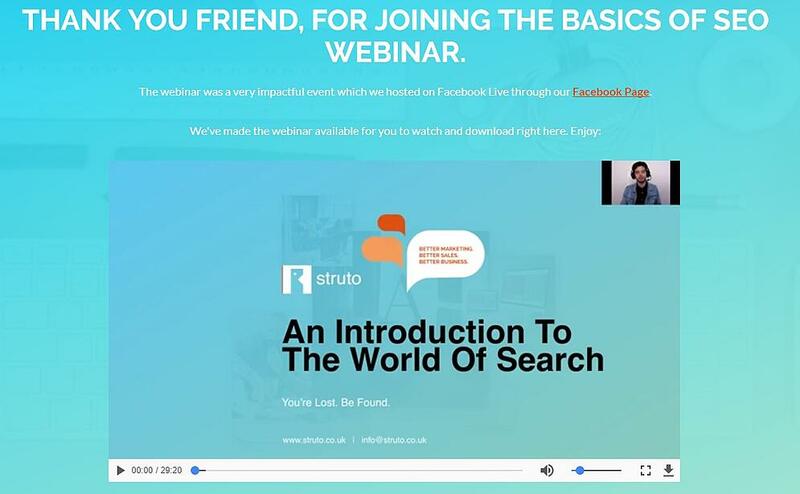 If your message can be conveyed through video then you should consider using this format? Audiences are often more likely to spend time passively watching a video than actively reading, so if you're able to create high-quality videos, then it's worth giving it a try. But remember, quality is key here. A low-quality video will just serve to cheapen your brand's image and message, instead of encouraging your target audience to convert. There's one last step here, and that's to take testing to heart. Make A/B testing a priority when creating your landing pages. It's through constant evaluation and testing that you'll spot what works and what doesn't, allowing you to make changes that matter and to boost your conversions. Wondering if a change in button text will encourage more downloads? Test it. Think a new heading might boost conversions? Test it. Keep testing to ensure your pages are optimised to perform at their best. Follow our nifty steps below to make sure your A/B testing is on point. Heat maps and click maps are a great way to monitor user's interactions with your website pages and test performance. We've created a simple slideshare that shows how these elements all come together to ramp up your conversion rates and immediately boost your lead generating efforts. Now you know all about landing pages, why we use them and how they benefit your businesses. The most important next step, is how to go about actually setting them up. Follow some of the rules and best practices we covered above, and use a reliable content management system (CMS) that allows you to set up a flexible campaign. Remember, the key here is to find what works and stick to it. Algorithms change and so to do trends. You're CMS should allow for easy updates, to align yourself with the latest marketing practices and to reach your intended crowd. We use HubSpot CMS for all our marketing efforts and as a HubSpot Platinum Partner, recommend the software as one of the best marketing and sales platforms around. Customisable modules and a simple WYSIWYG editor means that editing your pages are a synch. Don't believe me? 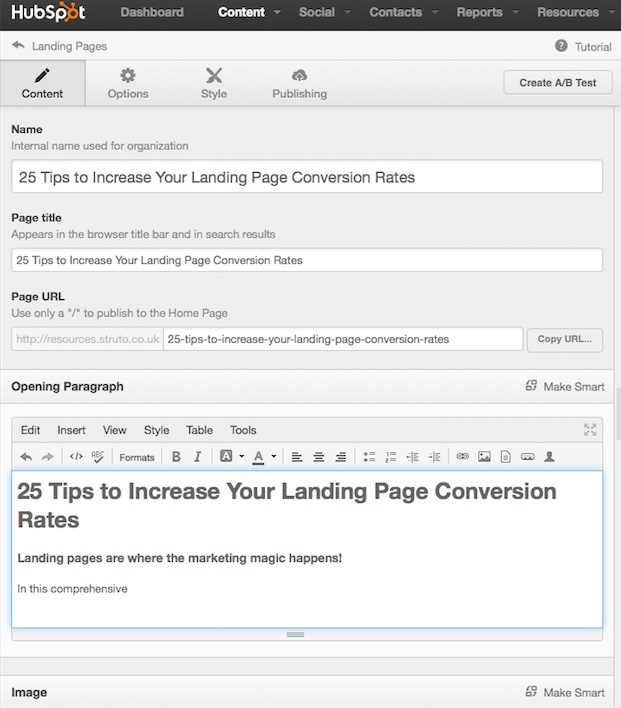 Here's how to go about setting up your landing page within HubSpot. Under the Content Menu you’ll find Landing Pages. Click on this link to take you to the Landing Pages manager. 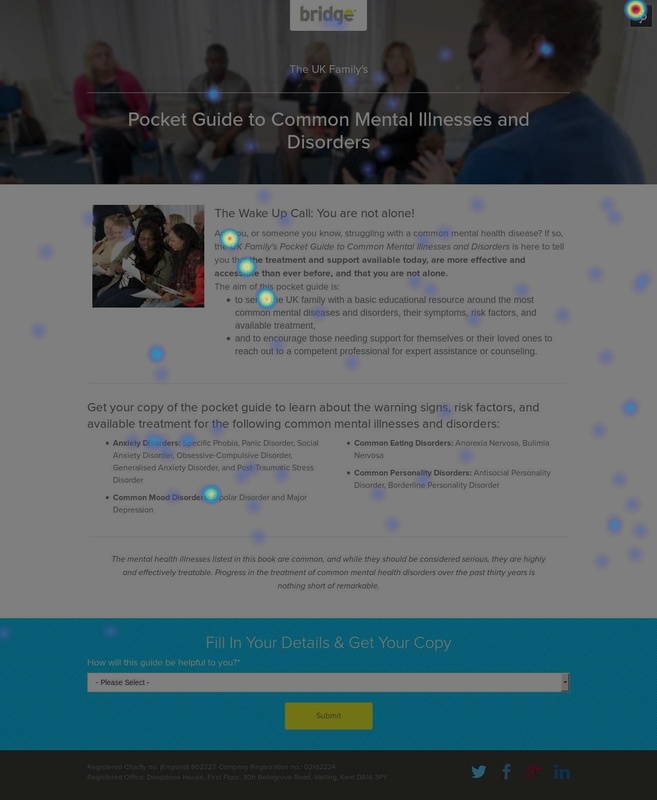 On the right hand side of the page, you’ll see a blue Create New Landing Page button. Click on that to take you to the next step. At this point you’ll select a template to use as the structure for your landing page. You can select one of your existing templates, buy a premium template through the HubSpot marketplace or create a new template layout. Select your desired template and then give your new landing page a name. Be descriptive enough so that other users in your HubSpot account will be able to find it easily and know exactly which offer it relates to. Click on Create to start working on your page content. There’s quite a bit to consider for this step, so I’ll tackle each element separately. The Page Title: Bearing in mind that your page title is a key SEO element and will appear as the heading of your search engine listing, you’ll want to makes sure that it is clear and compelling, describing exactly what is on offer – in 70 characters or less! The Page URL: In HubSpot this will be automatically generated based on your page title (as you type). If however, you would like to change the URL for any reason you are able to edit it directly in the pane. Just remember to keep your primary keywords in there for SEO benefit. Remember to include an illustrative, optimised image that represents your offer. We find that an image of a physical book cover for an eBook offer works quite well as it portrays the ‘tangible’ item. We have a post that outlines the essential elements of a killer landing page, if you want to make sure you are ticking all the boxes for maximum conversion. The landing page options tabs gives you the opportunity to assign your landing page to an existing campaign or add a new one. Here you’ll also complete your meta description for your page. Remember, this is the description that appears in search engine listings below your page title. While it doesn’t hold much SEO weight, you’ll want to make it as compelling as possible to entice the viewer to click through to your landing page. The style tab allows you to adjust the styling elements for the various components of your landing page such as the font, spacing, background and border features. Clicking the Create A/B Test button will open a new window – of the same landing page – where you are able to change out certain copy, images or any other content element to test performance against the original version. HubSpot gives you the option to publish immediately or to schedule publishing for a future date and time. This is handy if you are working on a landing page that is part of a campaign that still requires other elements to be completed before going live. If you've followed the steps, you now have your rocking HubSpot landing page up and running. Now it's time to promote the heck out of your offer to get some awesome quality leads! While optimised landing pages are vital to ensuring a good conversion rate, it's important that your content backs up what your landing pages promise. That's where your thank you pages come in, and also why it's so important to focus on getting your pages right and serving up exactly what you've promised. As the name implies, your thank you page is a medium that you use to convey your gratitude to your prospects for giving you their personal details. So make sure to thank them properly. Keep it simple, but acknowledge your appreciation for their willingness to exchange their details for your offer. Your site visitor has taken the time to share their personal details with you. It's up to you to ensure that they know they've landed on the correct page when downloading your offer and that they have a clear means of viewing or downloading the content you've promised them. Be sure that your offer's title is clearly displayed on your thank you page, and if your offer involves reaching out and contacting your prospect then you tell them when to expect your communication. Social media share buttons are an important part of thank you pages, in particular. After all, it's here that your prospect has gained access to your offer, and has the option to share it with their friends and contacts if they deem it worthy. A solid option for maximising this sharing opportunity is to have your downloadable offer open in a new window, without closing your thank you page. This allows your viewers to go back after opening your offer and share it from the thank you page. Not everyone who signs up for your offer will download it immediately. This is why you need to send an automated email response to your prospects once they send you their details, whether or not they download the offer immediately. In this email you can include a link to their download, and do a little promoting of your next offer, thereby enticing them further along the sales funnel. When a contact subscribes to your blog and sees a thank you page after signing up, it's an opportunity for you to highlight some of your best work, whether it's infographics or your top blog posts. It's an easy way of directing them towards exploring more of your content. For brand new subscribers, seeing testimonials of your work from satisfied customers is a great trust builder, and indication that they're on the right track in exploring your brand as a potential solution to their needs. You want to make sure your leads have ample opportunity to have a look around and explore your site. What you don't want is them closing your thank you page and disappearing from your site - instead encourage them to visit other pages by displaying navigation that's easy to use. Don't be fooled into thinking a thank you page is just a message ending off a lead conversion - it's so much more! Take full advantage of the opportunities it presents you with and optimise it to the max. Treat it as a chance to move your leads along their buyer's journey, while delighting them at the same time. Holistically, you'll need to ensure that both your landing pages and thank you pages are sucessful and hitting the mark. To do this, employ an A/B testing strategy as we mentioned above. A great, compelling headline can be the difference between a conversion and a bounce from your landing page. Be sure to include your unique value proposition and ensure that it is aligned to your visitors’ needs, not your own objectives. Evaluate your headline message. Is it unique, specific and useful to your audience? Is it compelling enough that your visitors want to read on further? Test the formatting of your headline. Could a centred headline be more effective than a left justified one? Should it be bigger? Perhasunctuated or capitalised differently? A different colour perhaps? We know that visuals work well to engage visitors. People process visual information far quicker than plain text so it is a good idea to include them on your landing pages. Images can also act as visual cues of where visitors should direct their attention. Play around with different styles (within your brand guidelines, of course). Does a product shot or an application image convert better? Naturally your copy should give the reader a better, deeper sense of what it is that is on offer. Ensure that you’re covering the benefits, the challenge, issue or pain your solution alleviates and how it works. Check if formatting your copy in a different way impacts conversion. Could you include a bullet list as opposed to paragraphs? Would bolding certain key words help drive conversion? Depending on the type of landing page, your CTA may be embedded within the form or it may be a stand-alone item to drive another action. Either way, testing your CTA is vitally important, as it is the critical component of the conversion path. Everything you have optimised up until now will be useless if your CTA fails. Play with the design, including colour. Is a square, flat design better than an embossed button with rounded corners? Does a change from red to green or blue or pink render a significant difference in results? Test whether the placement of your CTA impacts conversion rate. Does above the fold work well for your audience, or do they prefer somewhere after a little more information and more aligned to the visitor’s decision making process? In order to collect your new leads' or customers's details from your landing page, you're going to need to include a form. A form can generally create some anxiety for your visitors so it's imperative to do what you can to reduce the friction to convert. Try adjusting the layout of the form. Would a horizontal layout work better than a vertical format? Should you place your field labels on top of or to the left of the boxes? If you'd like to know more about creating content that converts, check out our eBook, Creating Great Content. It's full of tips to help ensure that you're creating content that is excellent. Alternatively, why not let one of our experts help you out? You can get in touch with them here.